Today, Max Kubert and Evan Nisenson of New York University drop some social media knowledge on Social Media for Colleges. (Yes, I rhymed that. Yes, you have to deal with it.) I work at a college with just under 4,000 students. Max and Evan work at a college with just under 40,000 students. Big difference. 36,000 students, to be exact. And hundreds of thousands of alumni. Max and Evan's social media work is targeted specifically for alumni of NYU's College of Arts and Sciences, a narrowing of scope that is very common for big schools. I'll be the first to admit that I have not done a good job thus far of highlighting the great work from these smaller, more niche pages (business schools, alumni offices, admissions departments, law school alumni, etc. ), even though they are doing a lot of the heavy lifting when it comes to higher ed social media engagement. It's just so much easier to seek out and find the main pages, and I am one lazy SOB. Which is why I'm particularly excited to have Max and Evan share their unique insight into doing social media for a niche higher ed market - not only because this blog needs to include more of that, but because their work at NYU is awesome and offers a lot of good ideas and great examples of great ways to engage alumni. Check out their work on NYU's Arts and Science's blog (which is really, really awesome), Facebook, and Twitter. And finally... if you know someone who should be featured or you yourself would like to talk a bit about the work you do, please let me know! You can reach me via email, Twitter, Facebook, or this lame comment thing. 1) How is the alumni audience unique? In your experience, what are they interested in that current students, parents, etc. aren't as interested in? I've noticed NYU's alumni social media efforts offer a lot of job resources, from highlighting alumni businesses on Facebook to providing career advice on the blog. Alumni are unique, especially from students and prospective students, because they represent a larger spectrum of ages and locations. Our audience isn’t just on campus, they’re all over the world—and they range from ages 22 to 100+. On Facebook, which is the quickest-growing SM platform in older age groups, we have to be mindful that our content will appeal to and be well-received by alumni of all ages and geographic locations. If we were simply trying to engage 22 year old alums who live in NYC, the page would look much different. On Twitter, we can be a little more targeted towards specific demographics by using hashtags or simply tweeting directly to an alum. In general, we’ve found that alumni use our social media for three things: to connect with each other; to reconnect with the university; and to reminisce. We often have alumni reach out via Twitter, LinkedIn or on FB asking to be connected with other alumni in different areas around the world—for example, San Francisco, Stockholm, Egypt. We have alumni who look to reconnect with us, especially through the blog, by simply sending us a note about a blog post they found interesting, or referring us to a story or alum we might want to feature. And lastly, it’s worth noting that our most popular posts are usually photos from around campus. We’ll share an Instagram of Washington Square Park, and soon we’ll have a thread of comments reminiscing about time spent as a student at NYU. 2) How do you use LinkedIn? Alumni use our LinkedIn pages to promote personal projects and post positions or internships available in their companies. They also will use it to reach out to fellow alumni for various reasons. We use the same LinkedIn pages to promote career-related opportunities and events available for our alumni. It’s also proven to be a really great way to reach out directly to alumni through “announcements.” When you send an announcement via LinkedIn, it’s emailed to all group members, and generally with a high response rate. For example, this year was the first time we used an “announcement” to promote our annual Alumni-Student Career Dinner, and we quickly received a record number of RSVP’s. It’s an effective alternative method to communicate with alumni. We’re always looking in publications, online and offline, for alumni to feature in the blog. We subscribe to online news outlets, read the New York Times, New York Magazine, etc. We go through Google Alerts every day and search keywords on Twitter. We also have stories come to us. Sometimes a colleague will pass something along, or often we’ll get calls from publicists or alumni who wish to be interviewed. When interviewing, we’ll typically ask questions via email, phone, or sometimes in person with a video or voice recorder. Then we’ll put together a post and promote it on all SM platforms. We usually have one post per week. A really great thing about initiating engagement with prominent alumni through the blog is that it allows us to start to unobtrusively build a meaningful connection with them. We are not fundraisers, but we often have success matching alumni with opportunities on campus after featuring them on the blog. Just one recent example—our keynote speaker for the Alumni-Student Career dinner mentioned previously was alumnus Gregory Giangrande—Executive VP of Time Inc., who was initially engaged with us through a blog interview. 4) Time to brag: What are a few examples of social media work at NYU that have been particularly successful? We started creating “Holiday Greeting” videos two years ago, and they always receive a lot of praise from the community. Here is last year’s. It’s shared via Twitter, FB, email and blog. We’re also very proud of the blog. It’s the only alumni blog we’ve found that incorporates video and audio interviews with alumni. It was created in 2008 and we just relaunched it in January with a new design and URL, which was really successful. On the blog page, we also have started to build an “Alumni Blogging Community” where we display links and logos to blogs that are run by alumni. They’re really excited to have their links displayed, and it’s connected us with a lot of interesting alumni. 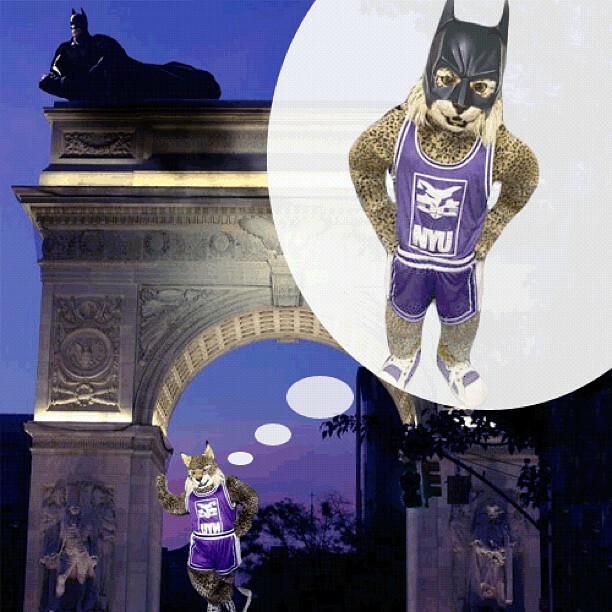 We also have a fun project going with our mascot—the NYU Bobcat. On Holidays or special occasions we’ll find a shot of the Bobcat and photoshop it to fit with the occasion. Alumni love it. Here are some examples. SM “success” really depends on how you measure it though. The biggest success we’ve had with social media is in converting online engagement into face-to-face engagement. For us, “likes” and “shares” and “retweets” are a sign that we’re doing something right, but we get the most value from alumni who were first engaged via SM, and then as a result of that engagement, gave us a call or attended an event. (Editor's note: This is EXACTLY how I feel about things too. Please think about this the next time you do a fill in the blank or "click like if you agree" or something like that. Yes, we all need to play the engagement game for EdgeRank, but likes/comments are not the end goal.) We use SM to create community first, and then we can use that active community to generate online buzz about an event we’re planning and to promote registration and increase attendance. After the event, we reconnect with attendees via email and post event photos to FB which alumni are encouraged to tag themselves in. We’ll often see that alumni are talking about events on Twitter and FB without us having to instigate conversation, which we see as a strong sign of success. Cornell University is way ahead of the curve in terms of how to incorporate social media into the University’s strategic vision (editor's note: their Facebook page has links to everything). They actually have a social media department comprised of a talented team that knows how to work effectively with the university’s PR, Marketing and other departments to build a really strong SM strategy. We also like what Boston University is doing with SM, especially on Facebook. They’ve created a truly interested and engaged community, rather than talking “at” their audience or simply asking generic questions. You should also take a look at the New York Road Runners’ FB page. It’s non-profit that has built an extremely strong community on FB that translates into active membership in their organization.